However, we generously allow guest to bring in outside foods and drinks and we also provide SELF CATERING with adequate kitchen facilities apart from giving FREE toasty and jams, coffee and tea for breakfast. Located in the QUIET AND SECURE neighborhood, Jitsin Village (where lots of expats and locals live), but only 10 minutes from the Sairee center and 15 minutes from the main beach allows us to stay chill in our privacy or easily enjoy all the highlights of the island. Diving Courses with special offer, Snorkeling Trips and Boat and Bus Tickets to next destinations (with Free Taxi to the pier) can be booked at the reception. 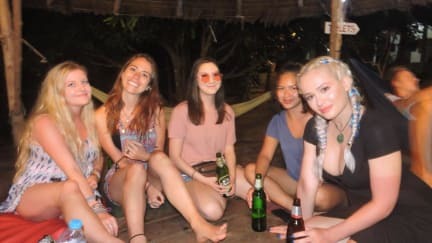 We regularly organize hostel dinners, BBQs and hostel nights out. NO DRUG policy is strictly required by our national law and our hostel. We DO NOT OFFER luxury but simple facilities so we can still offer the budget bed on this pricey island. Unnecessary comfy spring MATTRESSES or HOT SHOWER are pricey and difficult for maintaining in this island unstable electricity, every night party, salty and sandy island condition. LOOKING FOR SOMETHING DIFERENT! More Privacy, More Luxury, More right at the Center, More Crazy, SPICY IS NOT. We would love you to find what you are really looking for. 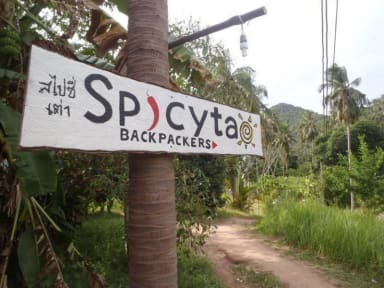 There are plenty and variety of accommodations in Koh Tao. BOOKING BED IN ADVANCE a week before or after the Full Moon Party since our hostel could be very busy during the time. "Young enough to be crazy and fun... Mature enough to understand and respect"